Rainford Tennis Club enjoyed their most successful season ever at the Liverpool Parks Tennis Tournament. 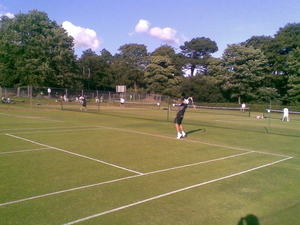 Nine players represented the Club at the week-long tournament on the grass courts at Calderstones Park. Dave Hillier reached the quarter-finals of the Men’s Singles and Men’s B Singles, whilst Alan Gillespie and Andy Gillespie reached the quarter-finals of the Men’s B Doubles. All the juniors were making their debuts in the competition and enjoyed success with Andy Gillespie and Conor Porteus reaching the quarter-finals of the 18 & Under Boys Singles. Alex Gillespie reached quarter-finals in both the 12 & Under and 14 & Under Boys Singles. Andrew Cornish, Joe Machin, Chris Pye and Mal Thomas were also in action in singles and doubles events. See photos from "The Parks"